The small, predominantly Christian community of Lumberton, TX is once again about to hit the national scene. 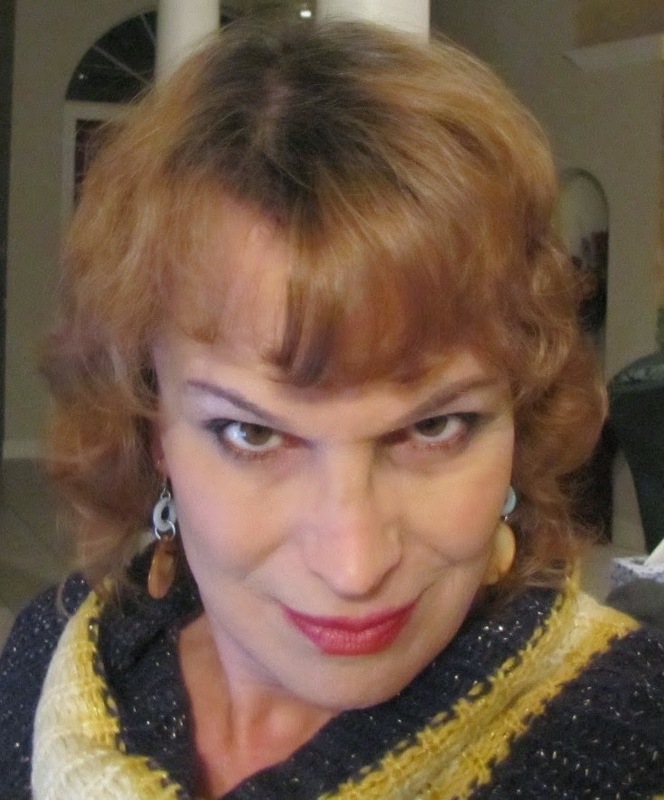 The Lumberton Independent School has suspended a transvestite teacher. There will be a School Board meeting this Thursday night at 7pm where it is expected there will be a large number of outspoken people from both sides who show up to speak during the public comment time. State Board of Education member David Bradly had this to say regarding the upcoming school board decision, “He does not have to be fired as substitutes are not under contract. 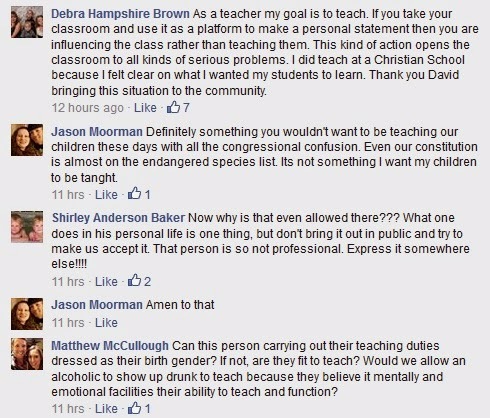 The district just fails to call him for the next days work.” Furthermore, men who want to dress up as women are not a protected class under the Constitution or state law and therefore the teacher can be fired. Especially in schools, there is broad authority to make decisions based on what the people of the community wants and believes is in the best interest of the vulnerable students of the school district. I suspect the man will try to sue and we will have a trial with national implications. 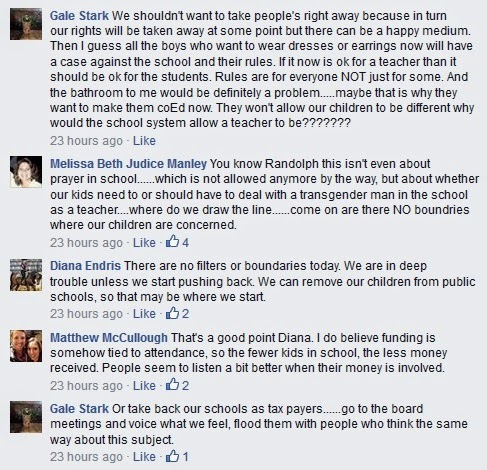 If the board goes into executive session to privately discuss personnel, some believe that the School Board will also discuss who hired him in the first place and thought it was ok for him to wear a dress in front of 10 year olds who were so distracted that they could not take their tests. Superintendent John Valastro has taken heat in recent years due to high profile issues. In this case, Valastro is not over picking substitute teachers, but he did suspend the teacher following the recent complaints. I have written several articles regarding Lumberton ISD issues, from vulgar school plays with cursing, to CSCOPE, to students wearing Muslim Burqas, to liberal teachers wearing vote Obama shirts and telling students not to watch Fox News. John Griffing’s WND story on the Burqa issue led to national attention and even helped push out CSCOPE curriculum on a statewide level (although it is still around). 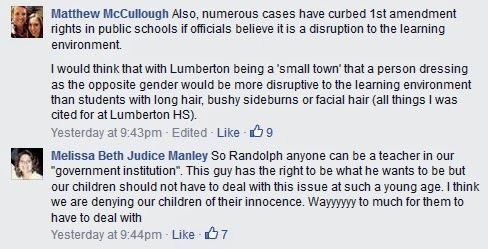 Lumberton is a great community and has a great educational environment compared to other public schools. I live here and I personally hate to see the school getting so much negative attention because it is not a reflection of the majority of the teachers and administration. Unfortunately, in order to fix problems and make sure they do not happen again, you have to expose the problems. It is a dirty job but someone has to do it. I first heard about the issue when my youngest brother came home and told me about the kids talking about a male substitute teacher that was in a different class. This teacher was signing his name as Mrs. I thought that was strange, but I did not realize the extent of what was going on until I heard Chip Darby talking about the issue on freedom 1300. 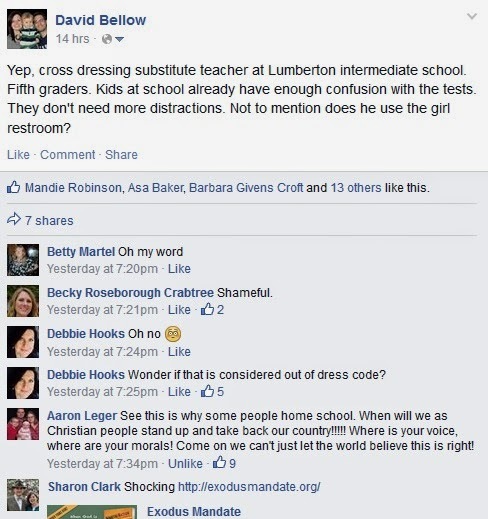 Apparently there was a male teacher wearing a dress and makeup at the Lumberton Intermediate School. The teacher’s name is Laura Jane Klug (born Kurt Klug). I looked him up on Facebook and what I found was an emotionally disturbed and confused older man. He has not always wanted to be a woman. According to a note he posted on his Facebook page on July 7th, 2011 titled “How Much More Can I Take?” Kurt Klug was emotionally distraught and seemingly ready to give in with his life because of the pain of his female wife leaving him. The pain and distraught of his wife leaving him must have driven him to decide that he wanted to become a woman. From 2011 until now, Kurt changed his name to Laura Jane Klug and started dressing up like a woman and acting like a woman. He has joined many lesbian, gay and transgender pages on Facebook. 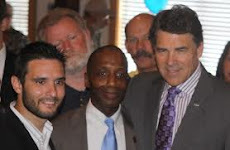 Oh, and he also likes Texas Politician Dan Branch’s page. Let me get one thing straight, I do not hate this man, nor am I angry at him. I feel bad for him. He was so hurt and emotionally distraught that he was driven to wanting a radical change. He seems like he was and maybe still is a Christian, but he is certainly hurting and has lost his way. We all have issues and this is his issue. That being said, a school house with young, impressionable, easily distracted and easily confused children is not the place for this man to be. The school has very strict dress codes and boys cannot even have long hair. The environment is controlled to minimize distractions so that the students can learn. Like it or not, a transvestite is a distraction. Not only that, he frightened and confused many students who then went home to their parents who had to have age inappropriate conversations with their children. Roger Beard, whose son was in the class Klug was subbing, is an outspoken parent who talked to the local Channel 12 News about this issue. He said what concerns him is the distraction he believes a transgender teacher poses to ten and eleven year old children. "If it does affect my child and his ability to learn or if it causes questions that I don't feel are appropriate then undoubtedly there's an issue with having somebody transgender, transsexual or transvestite, to be teaching that age group," Beard said. 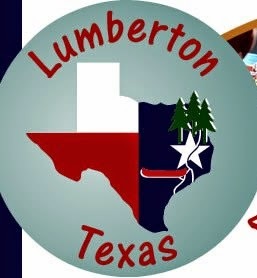 I wanted to hear what others in Lumberton had to say, that is when I took to Facebook to see what I could find out from friends who work at or have students at the Intermediate School. The response I got was overwhelming.